LOCATION, LOCATION, LOCATION! 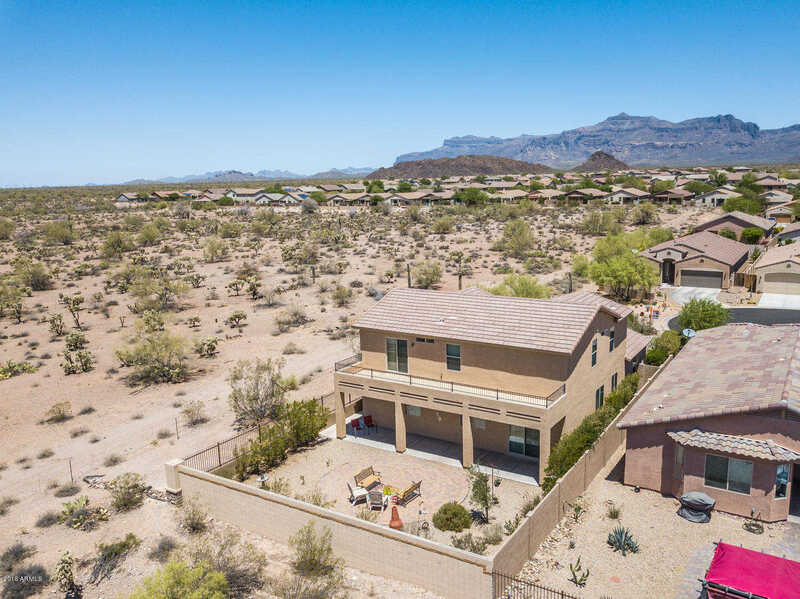 PREMIUM END OF CUL-DE-SAC LOT BOASTS BACK & SIDE YARDS ADJACENT TO OPEN DESERT! EXTENDED CONCRETE DRIVEWAY. MASTER SUITE ON MAIN LEVEL! THIS 2011 BUILT, 2,912 SF 5 BED, 3.5 BATH HOME IS A MUST SEE! WELL MAINTAINED HOME OFFERS PRIVACY & SPACE FOR FAMILY & FRIENDS. KITCHEN OPENS TO FAMILY ROOM W/ ACCESS TO SPACIOUS DINING AREA. LARGE COVERED PATIO, FULLY LANDSCAPED BACKYARD SPORTS CIRCULAR PAVER SEATING AREA & DESERT VIEWS. NEWER INTERIOR & EXTERIOR PAINT. THIS HOME IS GREAT FOR ENTERTAINING. SURROUNDED BY PUBLIC LAND & BOASTING AMAZING VIEWS OF THE SUPERSTITION MOUNTAINS, ENTRADA DEL ORO IS A HIKER’S, BIKER’S & 4 WHEEL’N ENTHUSIAST’S PARADISE! 10 MINUTES FROM 5 GOLD CANYON GOLF COURSES! THIS EASY CARE HOME GIVES YOU THE TIME TO ENJOY THE GOLD CANYON LIFESTYLE! Directions: FROM US 60, NORTH ON EL CAMINO VIEJO, STAY LEFT TO ENTRADA DEL ORO BLVD, L ON CAMINO DEL SOL, FIRST L ON SAN IGNACIO CT TO HOME AT END OF CUL-DE-SAC. Approximate size: 6513.00 sq. ft. Please, send me more information on this property: MLS# 5881432 – $299,900 – 18279 E San Ignacio Court, Gold Canyon, AZ 85118. I would like to schedule a showing appointment for this property: MLS# 5881432 – $299,900 – 18279 E San Ignacio Court, Gold Canyon, AZ 85118.